There have been a few announcements in recent months (usually from Dave B or Helen) suggesting that I was the 3rd lady of Meriden (Escape from Meriden Ultra 2018.) These announcements always exclude the real fact that there was not much running at speed involved on my part in this event and it was purely the true desperate need to get back to the comfort of a heated seat in the car that gave me and my joint 3rd friend the last dregs of energy to do that final mile. Not any actual athletic ability or drive. Partly as a result of this, I remain surrounded by people who genuinely believe that I am a person that can do this running thing. Fast forward exactly 4 months on from that Meriden day and it’s the morning of the Stafford Half Marathon 2019. I have entered this year to put to bed a demon from 3 years ago when I started but didn’t finish this race – when I got to 4 miles and gave up after setting off too fast and running out of steam. I gave up and did the walk of shame back to town. I wasn’t injured, I just didn’t know why I couldn’t run any further and I was truly gutted having to walk back to town in my running gear and wait for Dave. I wasn’t a BAT back then, so I didn’t know that other people had gone through similar things but had teammates to help them through. Yet they do. Or at least they do when you have an SMM top on. 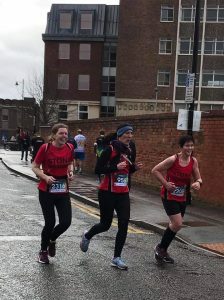 8.25am and despite our usual lack of race preparation (except a visit to Pasta di Piazza the night before) Helen and I arrived into Stafford telling each other that we were a) going to finish and b) going to beat our old PBs. We carried on with this wild exaggeration as we held court in the safety of the upstairs section of McDonalds. Other bats joined us and shared their aims of new PBs too. It seemed to be a day where we were all setting the bar high. As we went outside to join many more bats for the club photo, everyone was so positive and full of enthusiasm that I got swept up in the emotion of it all. I really felt part of this club and because of that, it was truly possible that I could finish this race today! By the beginning of Beaconside it was getting harder and harder to keep up with her, and going along Beaconside, in what seemed a bit of a cold wind, it got even harder. This road seemed never ending and I was really starting to struggle. Fortunately, just when it was needed the most, the Bat support was truly there in the guise of Lynda and Sarah, and Ben & Amy, and many others who just said well done to those in Stone MM tops! The support carried me through most of that road, but I did slow down, and thankfully Helen pulled away so I could finally take the opportunity to walk for a moment – something I had wanted to do for miles! Alas, it wasn’t to be for long… As I walked into the water stop along the A34, Jo Yendole came past and told me to get running again. The cheek! How dare she! Suddenly, a ‘previously unknown runner’ in me came out and there was no way I was letting her get away with that …. Instead, I found myself running after her and once caught up with her, vowing to stay by her side. Jo didn’t seem to mind – she didn’t like this section, so I think was happy for the company. We then caught up with Jenny, who incredibly, told us she had a back injury and yet she was still running despite this but now struggling more. We made a pact. The three of us would make it through together. 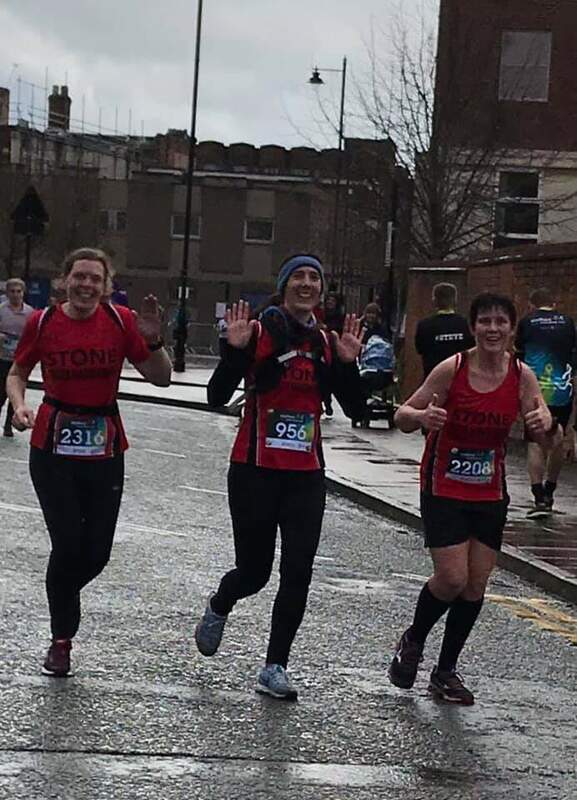 I think those last couple of miles were hard on all of us – Jenny with her back, Jo with that part of the route and me… well I was now genuinely running out of my comfort zone to keep up with Jo and Jenny, but as the 3 SMM vests stayed together, it felt so very right. So, we kept going to that last mile. Then that last 400 metres. When we finally turned that last corner to head to the finish line, we even found a little sprint still in us (see the great Mick Hall’s photographic evidence!) to make it through the finish line together. As we crossed over the timing mats, it didn’t just feel right, it truly felt amazing! Today, for me this was a great race. I finished on a high, knowing I ran faster than I had before (one of those elements of a race I previously seemed to avoid!) I not only got to put the old ‘flunked it demon’ to bed by finishing but I also got a 12 min PB on my previous half marathon time and Helen got a 16 min PB on hers. Walking back through Stafford we got pelted by a ridiculous hail storm, but even that couldn’t take the sense of achievement away. We saw other Bats who had achieved new PBs and read of many more through the afternoon and even where there may not have been PBs there were other achievements – the finishing of an event despite other factors (Jenny!) and of course, those who didn’t run but were there supporting with great smiles on their faces despite the weather as we passed by! (Alison – thank you!) For me, being an SMM club runner in this race today epitomised everything the ‘Great Club Chairman’ aka Tim has been known to harp on about… the Inclusiveness of runners of all abilities, the Camaraderie amongst those runners of all abilities at the start line and during the race and that bit of Competitiveness by the real runners in the club for a ‘proper running club’s’ sake!